Channel 4 News sourced an interview via Twitter today for the first time. Over the last few months the channel has increased its level of communication with users and viewers via its @channel4news Twitter account and presenter Krishnan Guru-Murthy’s own, @krishgm. It’s ‘just a new medium,’ he later added. “An eyewitness – Jonathan Nip [@nipp] – talking to Channel 4 News initially via Twitter and then on the phone also described the moment the plane came down as a “low thump” saying he thought there had been ‘an earthquake’. “He added that he thought he saw ‘just after the crash, people coming out of the plane’ but that it was ‘really hard to distinguish’, however adding: ‘at the same time a lot of ambulances came and a lot of emergency helicopters so that implies there are at least some survivors’ although he said ‘it looks really bad in any case’. Background: A Turkish airline passenger flight crashed in Amsterdam today and broke into several pieces, resulting in an unconfirmed number of casualties: latest update here. This entry was posted in Broadcasting, Handy tools and technology, Social media and blogging and tagged @nipp, airline passenger flight, Amsterdam, Channel 4, Jonathan Nip, Krishnan Guru-Murthy, Twitter on February 25, 2009 by Judith Townend. So the brief day that was Blog08 is over and our blogging reporter, Anne Helmond, is back home. She rounds up over on her own blog, with a few after-thoughts. She also rounds up a presentation by a blogging politician, Boris van der Ham, who has been voted the most web savvy of Dutch House of Representatives members. Thanks to Anne for all the insightful and speedy feedback. The event was ‘eclectic and random’, he says – just like blogging, but can we please get past the ‘old chestnut’ question of ‘journalism v blogging’? he asks. You can also watch some other video clips here. This entry was posted in Events and tagged Amsterdam, Anne Helmond, blog08, blogging, blogging reporter, blogs, Dutch House of Representatives, Edial Dekker, Ernst-Jan Pfauth, great speaker, International, Online Journalism blog, Paul Bradshaw, van der Ham on October 27, 2008 by Judith Townend. This entry was posted in Events and tagged Amsterdam, Anne Helmond, blog08, blogging, blogs, Flickr stream, International, Journalism on October 24, 2008 by Judith Townend. Pete Cashmore, founder and CEO of Mashable, has said bloggers should be finding niches to blog about and focusing on microblogging, according to Anne Helmond, our blogger on the ground at the Blog08 conference taking place in Amsterdam today. This entry was posted in Events and tagged Amsterdam, Anne Helmond, blog08, blogging, blogs, CEO, FriendFeed, mashable, media empires, Pete Cashmore, Twitter on October 24, 2008 by Laura Oliver. 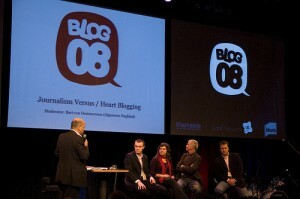 Anne Helmond will be blogging back from Blog08 for us, with a focus on the online journalism aspects. You’ll be able to follow Anne’s updates on this blog, or directly at this tag. Blog08 is a one day only event/conference for all things blog, taking place in Amsterdam with the rather exciting theme of ‘Rockstars of the Web’. 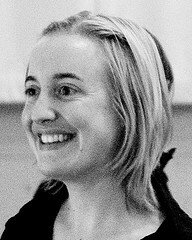 Anne Helmond is a New Media lecturer at the Mediastudies department at the University of Amsterdam. Her thesis entitled ‘Blogging for Engines. Blogs under the Influence of Software-Engine Relations’ aims to contribute to the existing research on blogs and blogging by framing it from a software-engine perspective and describing a different role of the blogger in this relationship. She continues her research on blogs and blogging with the Digital Methods Initiative at the University of Amsterdam. She blogs at annehelmond.nl. Blog08 Special II from Sacha Post on Vimeo. This entry was posted in Events, Online Journalism and tagged Amsterdam, Anne Helmond, blog08, blogging, blogs, Media lecturer at the Mediastudies department, online journalism aspects, software-engine perspective, University of Amsterdam on October 23, 2008 by Judith Townend. A range of mobile experts at the WAN World Digital Publishing Conference gave a more optimistic picture than at the AOP summit earlier this month, where speakers, including ITV’s head of mobile, said that we are still waiting for the year of mobile. But in Amsterdam, just a few weeks later, that sentiment was turned on its head. That next year will be the year of mobile is what people have said each year for five years, said Ilicco Elia, head of mobile for Reuters. 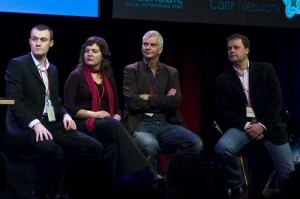 No, ‘it’s here’, he told the assembled range of newspaper experts at the World Digital Publishing Conference 2008. Where as Elia once was employed in ’emerging media’ for Reuters, he now very much part of the mainstream product: “mobile has since emerged,” he said. 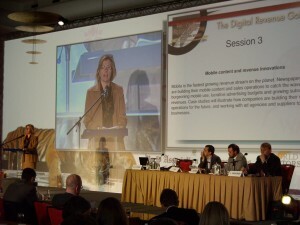 Elia certainly objected to one of Martha Stone’s slides during her presentation on online media, which said ‘mobile advertising to become a real business in a few years’. ‘My boss will shoot me, if he sees that’ he said. Elia’s been telling him that is already the case for a while; it is a real business. His presentation touched on examples where Reuters have successfully monetized mobile: in the IBM ‘Stop Talking, Start Doing’ campaign (a slogan that should be applied to mobile, Elia said); by using Nokia phone cameras on for fast and effective reporting, and for widgets on iGoogle. To think about search engine optimisation (SEO) is “a complete and utter given,” he said. “You have to do it – SEO and SE marketing – and it is a cheap way to send people to your site,” he said. The other mobile speakers sharing the stage, Jorma Härknönen, the senior vice president at MTV Media in Finland, responsible for internet and consumer businesses said were of similar opinion and Fredrik Oscarson, the founder and VP new business director for Mobiento, a Sweden based mobile marketing agency, were of similar opinion. “Give it five years time, and I think people will choose to surf news on the mobile, because the mobile will have functionality [e.g GPS] that the internet doesn’t,” Fredrik Oscarson told Journalism.co.uk. A short interview with Oscarson can be listened to here. He talks about mobile content for newspapers and different ways of advertising on mobile. This entry was posted in Events, Mobile, Online Journalism and tagged Amsterdam, business director, director for Mobiento, Finland, Fredrik Oscarson, GPS, head, head of mobile, IBM, Ilicco Elia, ITV, Jorma Härknönen, Journalism.co.uk, mainstream product, Martha Stone, mobile advertising, MTV Media, online media, reuters, search engine, search engine optimisation, senior vice president, senior vice president in Finland, Sweden, VP, WAN Amsterdam, WAN World Digital Publishing, World Digital Publishing on October 16, 2008 by Judith Townend.